CHICAGO - ILLINOIS - U.S.A. The World's Columbian Exposition, celebrating the 400th anniversary of Christopher Columbus' landing in America, was actually held in 1893, a year later than had been planned. New York City, Washington, D.C., St. Louis, and Chicago had all vied for the honor of hosting the exposition. It was during this vigorous and often vocal competition that Charles A. Dana, editor of the New York Sun, dubbed Chicago "that windy city." Chicago's lobbyists finally won out and, on April 25, 1890, President Benjamin Harrison signed the act that designated Chicago as the site of the exposition. It took three frantic years of preparation and work to produce the exposition. Although dedication ceremonies were held on October 21, 1892 even though the fairgrounds were not yet completed and opening to the public was delayed until May 1, 1893. The gates opened at the World’s Columbian Exposition (aka: Chicago World’s Fair) on time May 1st. Over the next six months, more than 26 million visitors would flock to the 600 acre fairgrounds and visit over 200 buildings full of art, food, entertainment, educational congresses and lectures, technological and gadgets. The fair, ostensibly meant to celebrate the 400th anniversary of Christopher Columbus’ voyage to the Americas. The World's Fair served as a showcase for a fully rebuilt and vibrant Chicago just twenty-two years after the Great Chicago Fire of 1871, which was celebrated as 'Chicago Day' on its anniversary, October 9, 1893. "The Midway Plaisance at the 1893 World's Columbian Exposition in Chicago." 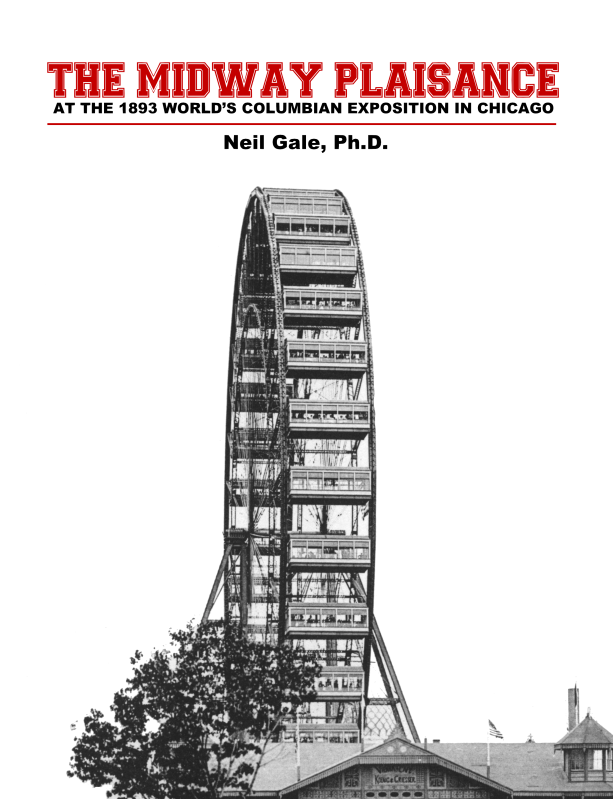 Is the first published book devoted exclusively to the World's Fair Midway as the beginning of the modern-day "Amusement Park". Forward by S. M. Senden, the critically acclaimed author of Chicago history books and Chicago based historical mystery novels. Chicago Day, October 9, 1893, commemorated the 22nd anniversary of the Great Chicago Fire of 1871, at the World's Columbian Exposition, Chicago, Illinois. The final tally, including paid admissions and free passes, was 761,942 attendees. NOTE: Many of the books, documents and videos in the Digital Research Library of Illinois History® are VERY LARGE FILE SIZES. Please be patient when downloading a file as the time it takes to complete the download is dependent upon the users bandwidth speed. The materials provided in the Digital Research Library of Illinois History® are appropriate for readers that are at least 13 years old. [PG-13]. Parental supervision suggested. Official Souvenir Programme, Dedicatory Ceremonies World's Columbian Exposition. 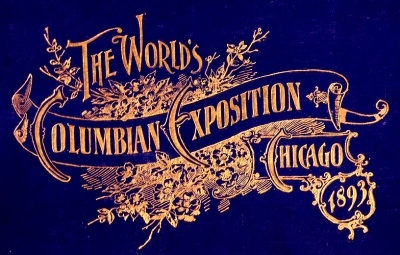 Short Summary; World's Columbian Exposition, Chicago, Illinois, 1893. Souvenir of the Dedicatory Ceremonies of the Iowa State Building, Jackson Park, Chicago, October 22, 1892. Battleship "Illinois" at the 1893 World's Columbian Exposition. Was it real or a mockup? Cold Storage Building Fire, July 10, 1893 at the World's Columbian Exposition. "EXPO" Magic of the White City. Narrated by Gene Wilder, full length film. First-Ever Brownie invented by Bertha Palmer for the 1893 World’s Columbian Exposition. John Bull Locomotive at the 1893 World's Columbian Exposition. Pabst Brewing Co. exposed facts about winning a Blue Ribbon (or Gold Medal) at the 1893 WCE. Pledge of Allegiance written for WCE; Honoring the 400th Anniversary of Columbus' Landing in the Americas. Proposal to house the entire 1893 World's Fair... within One Structure... and on Lake Michigan! Only Prize Medal Awarded at the 1893 World's Columbian Exposition. Snow and Ice Railway on the Midway Plaisance at the 1893 World's Fair. The Seven Surviving Structures of the Chicago World's Columbian Exposition 1893. Viking Ship at the 1893 World's Columbian Exposition. The assignments for special days were in the hands of the Committee on Ceremonies. The task was difficult, as the demand far exceeded the number of days on which the Exposition was open, and it became necessary to assign several celebrations to the same date; but no serious complications followed, as the space and the attendance gave ample opportunity for this arrangement. The States celebrated some day notable in their histories; foreign nations the birthday or coronation day of their sovereigns; and other days of special memories were recognized, as John Adams prophesied for the Fourth of July, "with sound of cannon and ringing of bells; with speeches, bonfires, and illuminations." All these special celebrations were occasions of great interest, by no means confined to those who were particularly concerned, but united in heartily by the multitudes assembled. Much credit is due to the Committee on Ceremonies and to Mr. Millet, of the Department of Functions, who gave time and thought to the preparation of the entertainments, many of which were unique, and all of which were fitly prepared and successfully carried into effect. Even Historian's can get 'caught-up' with all kinds of emotions when confronted with the insensitivities of the past. Please... don't judge the morality of the past by today's standards. Turn that frustration into a positive learning/teaching experience. Pass your knowledge forward. African Americans at the 1893 World's Columbian Exposition, A People Without a Nation. Boat Ride in the Lagoon, Beginning at Manufactures' Boat Landing and Ending at Japanese Pavilion. Country Zone Walk-thru of Costa Rica, Guatemala, and Brazil plus touring other country buildings. Court of Honor Buildings: Agriculture, Peristyle, Manufactures, Electricity, Administration, and Machinery. Daniel Burnham and the American City: "Make No Little Plans." Fine Arts Building Walk-thru Ending at the South End of the Lagoon, Brazil building and Darrow Bridge. Fine Arts Building Water Approach and a Walk-thru of the State Zone. Northern Most Section of the Elevated Intramural Going Through the Country and State Zones of the Fair. South Loop of Elevated Intramural Near the Convent of La Rabida, the Caravels, and Agriculture building. South Pond Approach to Pier, to Movable Sidewalk, Convent of La Rabida, Caravels, and Court of Honor. Spectatorium, Both; at the Point it was Abandoned and as Envisioned Being Completed. Street in Cairo was a very popular attraction on the Midway Plaisance. Transportation Building by Louis Sullivan was Talk of the Fair, Either "Highly Praised/Utterly Condemned." Wooded Island Tour; Moving from the South to the North and Ending at the Japanese Pavilion. Tons of other products at the Illinois History Store®. Easy to use. Minimal clicks. By design. Digital Research Library of Illinois History®. 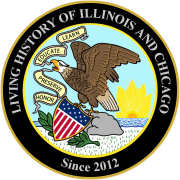 Living History Of Illinois and Chicago®. LivingHistoryOfIllinoisandChicago.org, 1893 WORLD'S COLUMBIAN EXPOSITION READING ROOM in the Digital Research Library of Illinois History®, The Foremost Digital Repository of Chicago World's Fair Books, Reports, Documents, Souvenir Albums and Research. World's Columbian Exposition Library and Repository, Chicago World's Fair Library, World's Columbian Exposition, Chicago, Illinois 1893 PDF Digital Books. World's Columbian Exposition, Chicago, Illinois 1893 PDF Digital Reports. World's Columbian Exposition, Chicago, Illinois 1893 PDF Digital Documents. World's Columbian Exposition, Chicago, Illinois 1893 PDF Digital Research. World's Columbian Exposition, Chicago, Illinois 1893 PDF Digital Souvenir Albums. 1893 WCE. 1893 World's Fair.